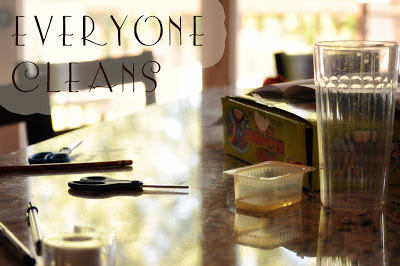 At our house, we have a cleaning policy for cleaning up a mess–“Everyone Cleans.” This isn’t something we thought through and planned on doing, but now that it is part of our family policy, I am so glad it is where we landed! When it is time to clean up a room, everyone helps clean everything. We don’t worry about which person played with what or who got what out. We just all help clean up. I think if you have it set up so people only clean up what they played with, you will have issues with “she played with it longer” or “she played with it last” or “she got it out.” We just all clean because we all live here and we all contribute to the home. We all work as a team and the job gets done quickly. Is it perfectly just? No. Definitely not. Older kids end up cleaning way more and the younger kids likely made it the messiest. I am not really into “just” anyway. Just has its place in the world, but I think in a family dynamic, mercy is a concept I want to highlight (you can get more of a taste for my thoughts on the idea in my post “Fair vs. Equal.”). If you adopt this policy of “Everyone Cleans,” you have to be careful that you don’t break it yourself. A common theme parents like to use when a child complains when told to clean up is, “I didn’t make the mess!” or “They aren’t my toys!” Instead of saying something along those lines, if you ask a child to clean up something and she complains about it, explain that everyone in the family helps clean and right now you are asking your child to clean up that mess and other people in the family are working on different chores. I won’t promise you will never hear “But I didn’t play with it!” when you implement this policy. Brayden hasn’t ever complained, but both of my girls have tried that line (and the girls are the ones who make the biggest messes). But a policy is a policy, and they know it. I think as parents we all know how frustrating it can be to clean a mess you took no part in making. Something you can focus on is that it is service when they didn’t make the mess, “What great service you are doing! Thank you for doing that!” I have found children love to be helpful. Kids also love to be thanked and praised for their efforts. Even if it is a mess they made, give some encouragement as they go. Even though it is my job to do the laundry every week, I sure appreciate when someone in my family thanks me for doing it. I have noticed my children love to be thanked for their efforts and have them be noticed. When having young children help clean, remember to give them a specific task at a time. If you tell a young child to clean a room, even a small room, she will most likely clean basically nothing and find something else to do. You will find success if you say, “Okay, I need you to clean up all of the books. Find all of the books and put them away where they go.” Once the books are clean, give another item to clean. Your child should be able to do this at around 3 years old. If you find that is too overwhelming for the child, then do each task with the child–one item at a time. You will likely need to clean with children ages 0-2. My children have been able to handle being told to clean a room around 6 years old. Give it a try! I promise you will love having this policy once it is part of your family culture. I started having my daughter help pick up her toys around a year old. I would put a block in her hand and held out the bin it went in, and she dropped it in. Definitely more work for me at the time. She's now 20 months, and I can just sit back and direct (ie. Put the books on the shelf, now put the blocks in the bucket) and she can do it all! If she wants to help with a chore I do what I can to encourage her so this is just part of life and not hated tasks in the future.